As part of the Korean Funds in Trust to UNESCO project for “Strengthening cultural and creative industries in Rwanda”, Rwanda held its 3rd National Steering Committee meeting on 23 May 2018 at the Rwandan Academy of Language and Culture (RALC). 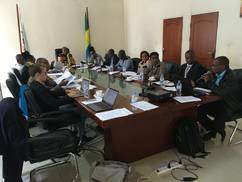 Fourteen members of the Rwandan National Steering Committee (NSC) for the UNESCO project to strengthen the cultural and creative industries in Rwanda came together in Kigali on 23 May 2018 to review the findings of Ishyo Arts Centre, the national implementation partner for the project, which included training capacity gaps identified during a national mapping exercise and a presentation of proposed trainings to respond to the capacity gaps. The National Steering Committee for the project is chaired by Dr. James Vuningoma, Director of the Rwandan Academy of Language and Culture and includes various experts from the Ministry of Sports and Culture, the Ministry of Trade and Industry, the Work Development Authority, the Rwandan Development Board, the Private Sector Federation, Rwanda Arts Council, the Rwanda Media Commission, the Media High Council, the National Youth Council, the Rwandan National Commission for UNESCO as well as cultural practitioners. Findings of the mapping were organized by the value chain of: creation production, distribution, consumption, education and training, and presented to the NSC for comments and validation, prior to the development of the targeted training modules. The NSC asked that information and awareness raising on copyright be included in the artists training gaps. They also highlighted the need to include people with disabilities among the targeted participants in all trainings. The national implementation partner for the project, Ishyo Arts Centre, is working under the guidance of Dr Jenny Mbaye, the UNESCO international expert advising on the project, and an expert for the 2005 UNESCO Convention for the Protection and Promotion of the Diversity of Cultural Expressions. The training programme to be developed through this project will target artists, cultural professionals, governmental, civil society and private sector actors who are working in the field of arts and culture to develop cultural and creative industries in Rwanda. Other beneficiaries include a wide range of stakeholders and the general public who will benefit from various cultural goods and services made available in Rwanda, and will enjoy them in a manner than respects intellectual property rights of creators. The project activities are continuing throughout 2018, and will continue to be guided by the insights and expertise of the National Steering Committee. The NSC recommended that training focus on the following three domains in the cultural industries: Performing arts (music, dance, theatre), film and visual arts. The next meeting of the National Steering Committee meeting will be held on 26 June 2018 to review the training programme methodology developed by Ishyo in close collaboration with the UNESCO international expert, Dr. Mbaye. The first training activities will be carried out in July 2018.